We quantify everything nowadays. It’s not enough to count each instance of a double play. We now have Weighted Grounded Into Double Plays. What this number tries to do is not only count the number of times a player grounds into double play, but also credit the times that he doesn’t. It’s used in fWAR, by the way. Unsurprisingly, the best at this are guys who hit a lot of flyballs like Cody Bellinger and Joey Gallo. 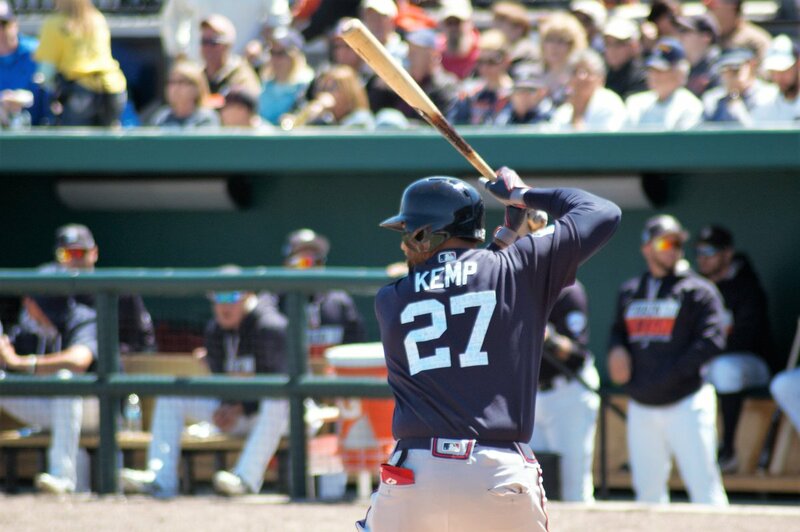 Matt Kemp isn’t in that camp. He’s near 50% in groundballs – not a particularly good thing when you aren’t known for your speed. Unsurprisingly, Kemp ranks extremely poorly in wGDP. Again, this isn’t shocking because he leads the league in GDP anyway, but wGDP goes that extra mile so it’s worth a look as well. Kemp’s wGDP is -3.1 It’s already the worst mark of his career. Line drives are a path to struggles for a pitcher. Not only are they massively dangerous, but their tendency to become hits makes them incredibly problematic. In 2014, hitters batted .685 with a .684 wOBA on line drives. That’s compared to a .220 wOBA on grounders and a .335 wOBA on flyballs. Mike Foltynewicz has a line-drive rate of 24%, the ninth highest such rate among starters entering play Friday. The Top 10 in this category is full of pitchers with around a 4.50 ERA or higher like Scott Feldman, Johnny Cueto, Justin Verlander, and Jeff Samardzija. Worse – over the last three years – Foltynewicz ranks third behind just Adam Wainwright and Jeremy Hellickson in line-drive rate. It’s difficult to be a success when so many balls are hit hard. It’s not impossible, but very difficult. unlike many of those pitchers, one advantage Foltynewicz has is his youth. He still has room to grow. Recently, I went over the Clutch statistic – a mixture of Win Probability Added with the leverage index of a situation taken into account. The Top 10 in Clutch this season includes some predictable names like Nolan Arenado, Kendrys Morales, and even Albert Pujols. It also includes two Braves. Brandon Phillips ranks 7th and Dansby Swanson ranks ninth. Considering the terrible year Swanson has had which has led to a recent demotion, that might be surprising. Well, don’t get too excited. It’s based largely on 36 PA in high leverage situations this season for Swanson. He’s 9-for-29 with four doubles, seven walks, and seven strikeouts in those moments. 36 PA is hardly a notable sample size, but for us fans of Swanson, it’s nice to find something good he ranks in the top 10 of. Since finally putting the arm troubles in the rear view (for the most part) that plagued him during his time with the Cubs, Arodys Vizcaino has continued to show that there are few pitchers in the game with his kind of velocity. Over the last three years, he’s averaged 98.3 mph on his fastball. Only six other relievers have averaged at least 98 mph. But Vizcaino’s story isn’t his velocity. It’s great, but his most effective pitch his is curveball. Over the last three years, it’s ranked ninth among relievers in pitch value – largely built on the seventh best vertical movement among bullpen guys during that time frame. So, while we are all in awe over what Vizzy’s heater can do, it’s ultimately a show-me pitch. It’s the curveball that pays the bills. It’s no secret that Brandon Phillips is not a guy who will stay in the batting box for long. Only 4.3% of his plate appearances have ended in a walk this season and his strikeout rate of 12.1% is also rather low. Phillips is up there to swing and the results bear that out. Of hitters with at least 200 PA this season, Phillips’s swing percentage is 10th at 55.8%. In fact, the Braves are attempting a radical strategy of keeping SunTrust Park cool by swinging early-and-often. Matt Kemp is 20th at 53.5%, Freddie Freeman is 22nd with 53.3%, Matt Adams is 26 at 52.6%, and Ender Inciarte is 32nd at 52.3%. Shockingly, the Braves entered play Friday with the fourth lowest walk percentage in baseball. He’s only tossed 7.1 innings in the majors to this point, but something we saw out of Akeel Morris in the minors is translating to continued success in the majors. No other pitcher in Gwinnett was getting more swinging strikes than Morris. In fact, 16% of his pitches resulted in a whiff at Gwinnett. So far in the majors, that number is 14.3%. That could hint toward continued success for Morris. At Least As Good As Adonis? Ronald Acuna‘s year has been off-the-charts awesome. It began with a winter-league run in Australia where he earned the moniker “The Answer to Everything.” He then hammered the Florida State League for a .370 wOBA over 28 games before being promoted to Double-A. Once there, his numbers improved a bit more and he earned another promotion to Triple-A. But you all know this already. What may not be as well known is the improvement he’s made at each level. Take all of this with a grain of salt because of short sample sizes, BUT…with each promotion, his walk rate has improved from 6.3% to 7.4% to 10.6% entering Friday. With each promotion, his strikeout rate has declined from 31.7% to 23.0% to 21.2%. In addition, his ISO has shown some improvement from .191 to .195 to .228. These three numbers are as exciting to me as any power or speed numbers he’s posted to this point. They suggest he’s only progressing. One of the best minor league stories in baseball has been the success of Mike Soroka at Double-A despite being just 19 years-old. One of the most efficient pitchers in the minor leagues, Soroka just doesn’t walk batters. By that, I mean he’s walked just 4.7% of opposing hitters. Considering his 2.99 FIP, that suggests Soroka is not a control artist, but a dominant one and his 21.5% strikeout rate bears that out. All told, he has nearly a 17% difference between his strikeout and walk rates. How good is that? Only 19 starters are doing that in the major leagues right now. Not too shabby for a kid who probably should be getting his feet wet at low-A ball right now considering his age. I have no idea what type of MLB pitcher Mike Soroka will be, but I am absolutely in love (not lurve, yet) with his ability to throw strikes and willingness to attack a hitter. He doesn't get ahead and nibble (Newcomb, Folty and most Braves pitching prospects for 10 years or so). He continues throwing the baseball and doing what got him ahead in the count. And because he isn't allowing free baserunners,the hits that fall or balls that leave the yard are less damaging. Yuse guys do good work. Keep it up! Thanks, Chris. I have to admit that I have my concerns and Stephen laid them out the other week about how pitchers with a 3/4's delivery can have issues when the platoon advantage swings the hitter's way, but I'm still very much in love with his pitchability and maturity. His ceiling may not match Allard, but his floor is very high and getting higher every year. Oh, and guys, if you aren't doing it yet, check out Chris's page at outfieldflyrule.com. A definite favorite of the Walk-Off Walk community. Hoping Soroka turns out to be like Brandon Beachy without the arm troubles.